The fully optimised 130” (2.88 x 1.62 m) Full HD 1080p LED display is an all-in-one solution for a quick and easy out-of-the-box installation. With a simple three step process, the complexity of a traditional LED build and installation is removed. With this unique pre-build process, installation time required is dramatically reduced from days to hours. The FHDQ130 comes pre-calibrated out-of-the-box, removing the hassle of managing software and the various associated files, whilst ensuring the image is optimised for use straight away. A range of connectivity and control options are available on the FHDQ130 including dual HDMI, USB, RS232 and HDBaseT. In addition, users can take advantage of Optoma’s Control Q application to control the display from smart phone or tablet. Boasting an ECO friendly <0.5W standby mode, that conforms with ErP regulations and the ability to control the display from a central control system, power consumption is reduced which saves on energy costs. With a simple three step process, the complexity of a traditional LED build and installation is removed. Simply connect the display sections, mount the display and apply LED tiles to the connecting area. With this unique pre-build process, installation time required is dramatically reduced from days to hours. The FHDQ130 comes pre-calibrated out-of-the-box, removing the hassle of managing software and the various associated files, whilst ensuring the image is optimised for use straight away. Integrated HQUltra and media player technology eliminates the need for any additional separate devices associated with traditional LED solutions. A unique 4-in-1 SMD layout which sees SMDs grouped in fours under one surface, allowing for a smoother screen surface, wide viewing angle and a more robust design. Supporting <0.5W in standby mode, that conforms with ErP regulations and the ability to manage the display from a central control system, power consumption is reduced which saves on energy costs. Boasting a unique QUAD pixel design, contrast levels are improved allowing for darker blacks and brighter whites. 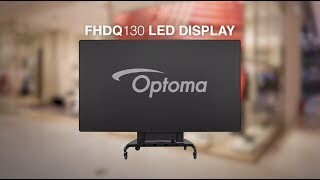 Optoma LED displays use industry leading HQUltra 4K image processing technology which provides best in class picture quality with low latency video processing. Inputs can be switched seamlessly in as little as 0.25 seconds. The same processor can directly drive loudspeakers in meeting rooms and smaller conference rooms, plus line level balanced stereo outputs to drive an external amplifier or powered loudspeakers. The FHDQ130 supports a wide viewing angle of 170 degrees allowing for image retention across a range of viewing locations. Take advantage of Optoma’s Control Q application to control the LED display from a smartphone or tablet. It enables users to control the display and also manage or add content to the in-built media player.